A Certified Nursing Assistant, widely known as CNA, is a medical officer who works in a medical facility under the supervision of a Registered Nurse (RN) performs different kinds of duties. Also the duty of a CNA varies from one working environment to another. For instance, the duties of CNA working at an elderly homecare facility may greatly vary from the duties of a CNA working at a large hospital. However the basic duties and responsibilities, and the basic knowledge and skills required by a Certified Nursing Assistant are generally the same at most places. Usually, the job of a CNA is to help the patients with their activities of daily living. Also, the workload of a CNA may vary from patient to patient depending on their condition. The basic CNA job description is to assist the patients as well as the doctors in a range of activities. 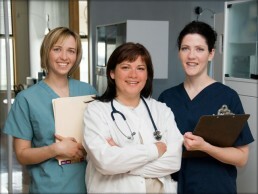 Certified Nursing Assistants essentially assist the nurses in admitting, transferring and discharging the patients. Just after a patient is admitted to the medical facility, a CNA comes into action. The CNA helps in registering the patients, maintaining documents and giving them instructions. CNA also need to measure vital signs of the patients such as measuring blood pressure, pulse, temperature, etc and report them to the physician or doctor. A CNA needs to look after the feeding schedules of a patient. They may also be required to monitor the urine outfit and other important details to help ensure a comprehensive chart for each patient. Along with the feeding schedules of the patients, a CNA is also required to maintain the bedding and bathing of the patients. They need to take care of the patient’s hygiene. Apart from physical support, a CNA is also required to provide emotional support to the patient. They provide an emotional comfort and care to the patients. The CNA should always be ready to work in any kind of conditions. At hospitals, there may be a sudden rush of patients or there may be some patients in extreme conditions. A hospital may also have been flooded with patients having certain kind of diseases, so a CNA should always be ready to work in such a condition. Also, CNAs may not have fixed schedules and may be required to work both night and day duties, so they should be ready to take on their position whenever required. A CNA is also responsible for assisting patients in a range of motion activities. Patients who can’t help themselves to ambulate or change their position, they are helped by CNA to ambulate or shift positions. CNA must also have a number of other skills. They are expected to have good communication and motivation skills. They are also expected to interact well with the patients and their visiting members.